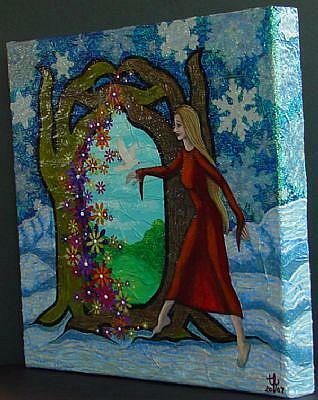 Titled as “The Door into Summer” this canvas shows a young woman stepping from a wintry landscape into a doorway crafted from two mirrored tree trunks. 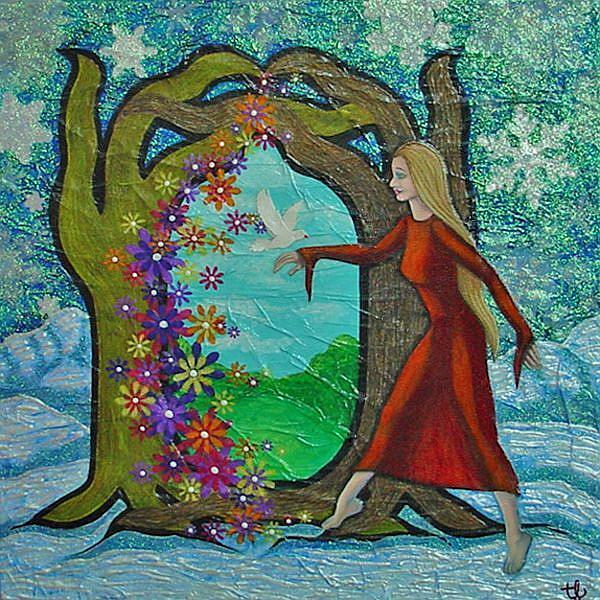 The door leads into a summer scene and colorful flowers spill through on the left side. The canvas measures 14 inches square and is approximately 1 and 5/8 inches deep. The painting wraps around the edges, so there is no need for a frame. 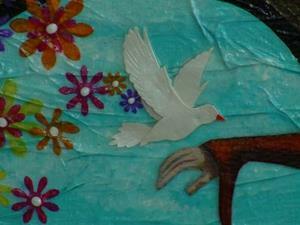 This piece is highly textured and has many layers of papers, paints and glaze. All parts are uniquely hand rendered by me with exception of the tiny dove and the snowflakes, which are stickers. The flowers were created with layers of shaped paper punches. The woman was drawn with prismacolor pencils on heavy watercolor paper. 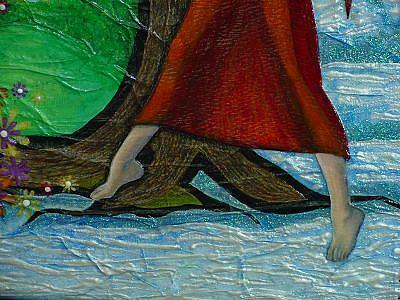 The tree trunks are mulberry papers, accented with colored pencils. 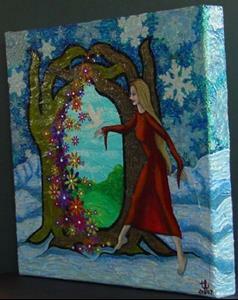 Dimensional paint adds ripples in the snow and glitter glaze covers the entire winter landscape. The piece is protected with two coats of Liquitex glossy varnish and is ready to hang. Photos do not illustrate the depth of this unique artwork and cannot do justice to the quality of the work. Unfortunately the gloss shows the creases and peaks of the paper in the collage as white flecks and feathery lines that are not truly there. This one of a kind painting collage is my entry in the Nibblefest Art Contest, a themed art contest beginning on the 20th of each month. This month's theme is Doors-Doorways.